After finishing 45th in Stage 2 of the Tour Down Under, Lance Armstrong answered a few questions and then was escorted into a royal blue Skoda car and beat a quick exit from the oval where the team support vehicles were set up....Most cyclists wait until the entire team has settled down, rehydrated, done interviews, relaxed a bit and then get on a team bus and head back to the hotel. And then there are the smart guys, such as Team Columbia's George Hincapie...He rode his bicycle the 15 miles from the finish in Stirling to the Hilton in Adelaide. Bicyclists in California are getting excited in anticipation of next month's big Amgen Tour of California, arguably the most significant bicycle race in the U.S. It begins February 14 in Sacramento, and your blogging correspondent will be there. Bicycle racing has little to do with bike commuting, except in the sense that it helps raise awareness of bicycling in general. Certainly Lance Armstrong's success in the Tour de France inspired many Americans to take up bicycling, and many have continued as bicycle commuters. Armstrong has since become a proponent of bicycling and bike commuting, most notably with his support of the League of American Bicyclists and the recent opening of his Mellow Johnny's bicycle shop in downtown Austin. And it's hard not to admire George Hincapie, an extremely talented bike racer and consummate team player, who has subordinated own chances to be Armstrong's most trusted lieutenant on the great USPS and Discovery teams. I had the opportunity to witness Hincapie's victory in the 2001 San Francisco Grand Prix, an important but short-lived one-day race. Image: Graham Watson, from GeorgeHincapie.com. Tip of the Pendleton felt hat to Subcommandant Sasquatch for the tip. For most of us who ride our bikes to commute, it's no problem in the spring, summer and fall, when temperatures are balmy and the sun shines. When the thermometer drops and the daylight is abbreviated, though, many of us put the bike away and turn to the auto. But with a little planning and precaution, biking during the colder months can be rewarding, invigorating and can even help save a little money. With an historic inauguration now behind us, and Groundhog Day on the near horizon, cyclists in the frigid north can be hopeful for the arrival of warmer weather. In the meantime, winter still presents challenges to bicycle commuters. This inspiring article by the executive director of Community Cycles in Boulder offers great encouragement, with advice on clothing, equipment, and travel routes. The author also correctly advises greater caution bicycling in winter. Bicycle commuting is very enjoyable all year round, in all seasons, provided adequate preparation. Winter cycling presents a number of challenging conditions, such as the low-visibility foggy streets in the picture above, a typical winter riding challenge in California's Central Valley. Beyond cold, winter cycling means lower visibility, with dimmer light and shorter days. Get a headlight , rear lights , and high visibility clothing . Think about reflectivizing to your bicycle, or even adding a personal laser bike lane. Street surfaces are also more hazardous during cold weather. When riding, anticipate slower braking, slicker street surfaces, and slower turns. Be more attentive for broken pavement and potholes, and metal surfaces are slippery when wet. Days are slowly getting longer, winter is slowly winding down. Keep hope alive! Keep pedaling. Image: Paul Dorn. Winter fog in Davis, CA. 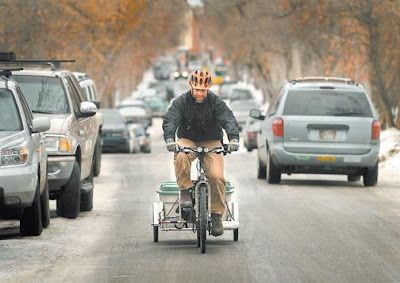 It's 2009, and the Bicycle Commuter Act is getting significant media attention, from warm West Palm Beach to frosty Minneapolis. This media attention is very welcome. Most employers are probably unaware of the new bicycle commuting benefit, and many employers are struggling to understand implementation. One Silicon Valley bicyclist, entrepreneur, and Bike Commute Tips blog reader is developing a website to help cyclists gain Bike Commuter Act benefits at their workplace, including an application where you can send an e-card to your boss or HR director explaining your interest: BikeBux.com. The actual benefit of the act, about $240 per individual cyclist each year is helpful, but minimal. The biggest benefit of the Bicycle Commuter Act is that it legitimizes bicycling as a commuting mode. This might inspire more employers to think about providing showers, lockers, secure bicycle parking, and other inducements to their employees. Providing free vehicle parking for employees is expensive (construction, maintenance, insurance, security, lighting, etc. ), wastes valuable real estate, and offends a company's neighbors ("Too much traffic!") Employers can save money and burnish their corporate citizen credentials by offering their employees diverse transportation options, especially sustainable ones like bicycling. Does your employer offer or plan to offer this bike commuter act benefit? Two wheels, no motor, no problem for local commuter! Everything Elisa Munoz brings to work must fit in a small backpack. "Makeup, notebook, Ipod, wallet...it's very heavy actually," said Munoz. She is one of a few local commuters who brave rush hour traffic on two wheels with no motor and no roof. "You know I just chance it in case it rains. Hopefully it won't!" said Munoz. Her seven mile bicycle commute from Birmingham to Irondale begins in a car because the first stretch is so dangerous. "I have to come up over the mountain and there are no shoulders and there's no sidewalks which are illegal to ride on anyway," said Munoz. She parks about a mile away from her home and pedals the rest of the 20 minute trip. 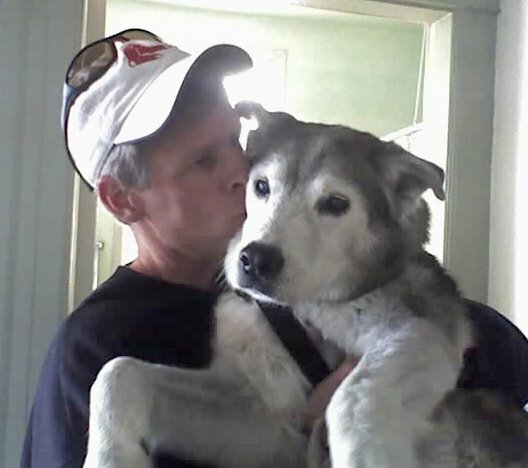 Munoz says she's been chased by dogs and even run off the road, but mostly she just runs into attitude. "I get a lot of looks. I get honks. I get occasional yells to get on the sidewalk even when there is no sidewalk and to get off the road a lot," said Elisa Munoz. To promote cooperation between bicycle commuters and drivers the Birmingham Regional Planning Commission is organizing a bike to workday (sic) in May. "It's an awareness raising thing...It's a way to get cyclists to see that just because they are biking doesn't mean that they own the road," said Sean Saffle. OK, I grew up in New England, now live in California, and have never been in Alabama. So I may be accused of Northern bias. But from what I've read, it seems Alabama is truly deserving of its #48 ranking of bicycle-friendly states in the U.S. That's third from the worst. It just doesn't seem a very hospitable state for bicyclists. Any insights from 'Bama bikers? This article itself is very suggestive. It's news that a person bikes at all! She drives the first mile! The SmartCommute guy says Bike to Work Day is about disciplining cyclists!?! I'd been hopeful of progress when the Birmingham News introduced an intriguing bicycling columnist. For sure California has some hostile roads, but this report is just scary. Any perspectives? How can we make it better? For the record, this Northerner absolutely fell in love with Savannah on my first visit in November. On a freezing November morning in Chicago, Megan Mason puts on leggings, several polyester tops and a fleece, a windbreaker, four pairs of gloves, and silk sock liners. 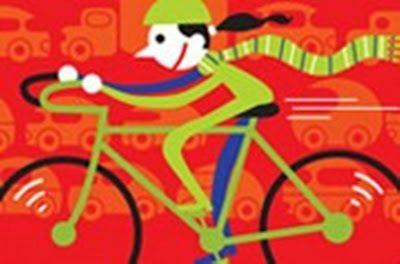 She ties a bandana over her head, dons earmuffs, snaps on a helmet, safety-pins a scarf into a cocoon around her head, and gets on her bright green Schwinn for a 6.5-mile ride to work. The momentum continues for bicycling in 2009, with this "50 Ways to Improve Your Life in 2009" feature in an important national news magazine. "Bike to Work" tops the suggestions for the "Your Body" category--which also suggests napping and an eye exam--in U.S. News & World Report's "50 Ways to Improve Your Life in 2009" feature. Despite the recent decline in gas prices, this new year is a very promising one for bicycle commuting. This article mentions the new Bicycle Commuter Act taking effect in 2009, which can help employers support bicycle-related expenses. Much of the political talk is of a need for economic stimulus, which could present opportunities to improve local bicycling conditions (more on this later.) 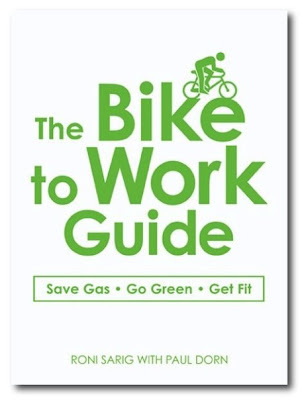 And two new bicycle commuting books are now out to help aspiring bike commuters: my own book (with Roni Sarig) The Bike to Work Guide: What You Need to Know to Save Gas, Go Green, Get Fit; and the Bike to Work Book, by Tim Grahl of CommutebyBike.com and Carlton Reid of BikeforAll.net. One of the best ways to encourage more bicycle commuting is to simply keep riding, offering a visible presence on the streets and role model among our associates. 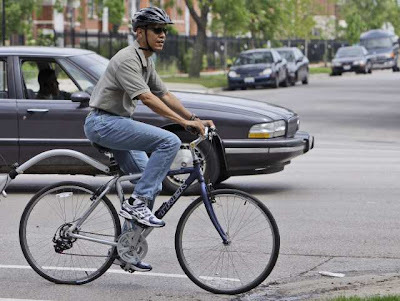 What else do you plan to do to encourage more bicycle commuting among your colleagues and friends in 2009? Miami's long-downtrodden but growing community of bicyclists is reaping a sudden bonanza: Miles of new bike lanes and plans for more. A new monthly, family-friendly bike festival downtown. And a clutch of bike-friendly proposals designed to promote cycling for recreation and commuting. On Saturday, Miami-Dade County will formally inaugurate new dedicated bike lanes along the full length of the Rickenbacker Causeway by closing half the roadway for the morning and letting cyclists, roller bladers and pedestrians have the run of it. The following weekend, on Jan. 18, the city of Miami will host the third, expanded edition of Bike Miami Days, the monthly effort by the administration of Mayor Manny Diaz to promote urban fun and safe cycling by closing off streets in downtown and the Brickell area in hopeful emulation of the famed Ciclovía in Bogotá. And that's not all: Miami-Dade Commissioner Carlos Gimenez is sponsoring an ordinance, patterned after regulations in Portland and other famously bike-friendly cities, that would require bike racks in all new public and private commercial developments in unincorporated areas, plus encourage installation of showers and lockers for bike commuters. "There's a lot of big momentum," said Brett Bibeau, chairman of the county's Bicycle/Pedestrian Advisory Committee. "There is significant progress being made." If anything, Miami is coming late to the pedal party. The popularity of cycling is rising sharply across the country, and bike lanes, bike parking and other forms of "bicycle infrastructure" are increasingly seen as essential urban amenities. WASHINGTON (Reuters)-More than half of Americans admit they never use a helmet while bicycling and more than a quarter skip the sunscreen, even when they are in the sun all day, according to Consumer Reports National Research Center. Similarly, sunscreen can prevent skin cancer, which is by far the most common cause of cancer, although the two most common types are rarely deadly. The American Cancer Society estimated that more than 1 million new cases of basal and squamous cell cancers were diagnosed in 2008. Helmets are an often heated topic among bicyclists. The proponents of strict helmet use and the proponents of helmet-optional cycling offer intense arguments in support of their respective positions. And articles such as this indicate a clear bias in favor of helmet use: "cyclists admit riding without helmets...tsk, tsk." The media perpetuates a popular perception that bicycling is in itself a dangerous activity, and that riding without a helmet is wanton recklessness. Of course, this is complete nonsense. Bicycling is safe. Bicycle-related fatalities each year are relatively few, and easily avoidable with proper riding technique (stay sober, ride with traffic, use lights when riding at night, etc.) 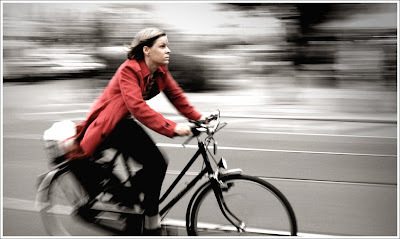 Certainly bicycling kills fewer people each year than sedentary lifestyles. Helmets are not, repeat not, necessary to happily bike commute. In much of the world where bicycling is more prevalent, helmets are rarely used. Bicyclists should use their own judgment; if they feel safer with a helmet, fine. Helmets are certainly justified in higher-risk cycling activities, such as high-adrenaline racing or mountain biking. It is important to stress, however: helmets merely mitigate the consequences of a crash, they don't prevent a crash. Many of the minimal risks of bicycle commuting can be avoided or mitigated through effective maintenance, proper bicycling technique, attentive riding, and street smarts.